Paul’s father was a salesman on the Liverpool cotton exchange, his mother a midwife. After moving several times after the War, in 1955 Paul’s family moved to a Council House at 20 Forthlin Road (which is now a tourist attraction). His father had an amateur Jazz Band, played piano by ear, and taught both his sons many tunes, as well as how to sing in harmony. His mother Mary died from cancer in 1956, when Paul was 14, and he immersed himself in music to help himself deal with the grief. George Harrison was at the same school as Paul, and going there they would often meet on the top of the bus. Paul met John Lennon in July 1957, at a village fête where John’s skiffle group The Quarry Men were playing. Paul impressed him by knowing the words and being able to play the guitar for rock ‘n roll numbers, and it was evident they both were very interested in it – and also both had already written some songs of their own. Paul knew how to play the guitar (left-handed), and he and John (right-handed) would sit and practise, working out the chords together. Once they took a bus across town because they heard of someone who knew how to play a B7! John Lennon, eighteen months older than Paul, was brought up by his Aunt Mimi, in a middle-class home called Mendips, at 251 Menlove Avenue, about a mile away from Paul’s home (now also on the tourist route). John’s parents were separated – his father was a seaman, and his mother lived with another man who didn’t want John around. John lost his mother Julia in a car accident in 1958, when he was seventeen. Since both wanted to write songs, they would work composing together in Forthlin Road or Mendips in the afternoons, writing the words (and sometimes the chords) down in a little notebook. They had a rule that, if they couldn’t remember the song next day, it wasn’t memorable anyway, and would make no effort to play it. But some went into the repertoire, like One after 909, and Love Me Do. This last was the Beatles’ first hit, and also today one of the two songs the writers still control – the other is PS I love you. The Quarry Men’s repertoire expanded fast – and in 1958 George Harrison was allowed to join – he could play solos! They played gigs and gradually music became more important then school work – and the end of National Service meant they could stay together as a group, even after some members turned eighteen. 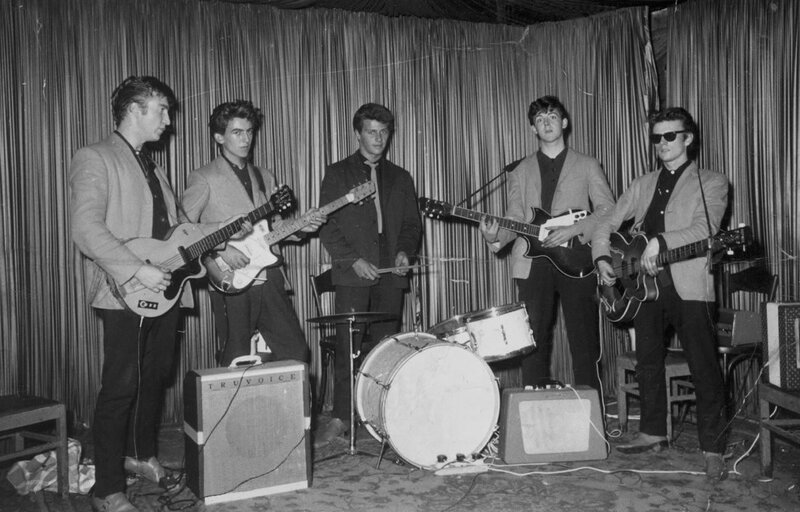 In August 1960, the Quarry Men – now renamed The Beatles – were contracted to play at a club in Hamburg for £2.50 per man per night, playing from 8:30pm to 2am with 3 half-hour breaks, seven nights a week (the group then was made up of John, Paul, George, Stuart Sutcliffe on bass and Pete Best on drums).They had to attact an audience and keep them happy, and sometimes would improvise on What’d I say (a Ray Charles number) for an hour at a stretch. In Hamburg, they developed the Beatles look, and learnt to play together whatever, even with fights erupting among the rough clientele! In all, they made five visits to Hamburg up to late 1962, on progressively better financial terms (but having to play from 7pm to 2am! ), spending nearly a year there all told. 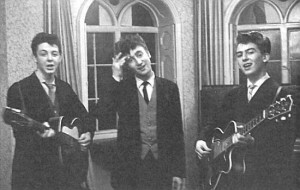 When the Beatles first returned to England from Hamburg, they played gigs around Liverpool, including one at the Litherland Town Hall on 27th December 1960. This is widely regarded as being a turning point in their careers, because the audience went into a frenzy of excitement, and they became the leaders of the Merseyside beat scene (which at that time had over 300 working groups). They began also to build a faithful following of fans who followed them everywhere. So there’s one good reason why 2010 is being considered the 50th Anniversary year of the Beatles! 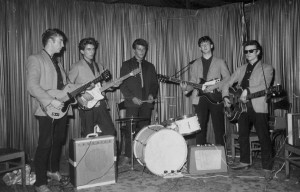 In February 1961 the Beatles began playing at the Cavern Club, in short lunchtime and evening sessions, among other acts. Because of the competition from other groups, they looked to perform little-known numbers (which were quickly copied by others) but then began to introduce their own songs – which was rather looked down on at that time. It was after hearing them at the Cavern Club that Brian Epstein, who owned record shops in Liverpool, heard them and offered to become their manager. They signed with him in January 1961, and he worked hard to make them more widely known, and get them a recording contract. This finally came in June 1962, when they were signed by George Martin at Parlaphone (EMI) – but it took two more sessions to get to something acceptable commercially; before then Pete Best on drums was changed for Ringo Starr. (Stuart Sutcliffe had stayed behind in Germany). So the group was John, Paul, George and Ringo, as we know them now. Love me Do http://www.beatlestube.net/video.php?title=Love+Me+Do was released as a single in October 1962. They were working hard, sometimes playing at the Cavern in a lunchtime session, then having two evening engagements in different venues – plus radio and TV sessions. 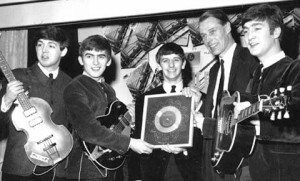 In March 1963 their first album was released – Please Please Me http://www.beatlestube.net/video.php?title=Please+Please+Me. Of the 14 songs, more than half were Lennon/McCartney originals. By the time they finished playing the Cavern Club in August 1963, they were a highly professional outfit, with good stage presence, a special “look”, fascinating personalities, their own songs, a No.1 Single, and a No.1 Album. Posted in Pop | Comments Off on The Beatles: 50 years? You are currently browsing the GOOD LISTENING weblog archives for September, 2010. Entries (RSS) and Comments (RSS). 20 queries. 1.384 seconds.